We’re proud to partner with Disney Book Group to bring you this original recipe and story! 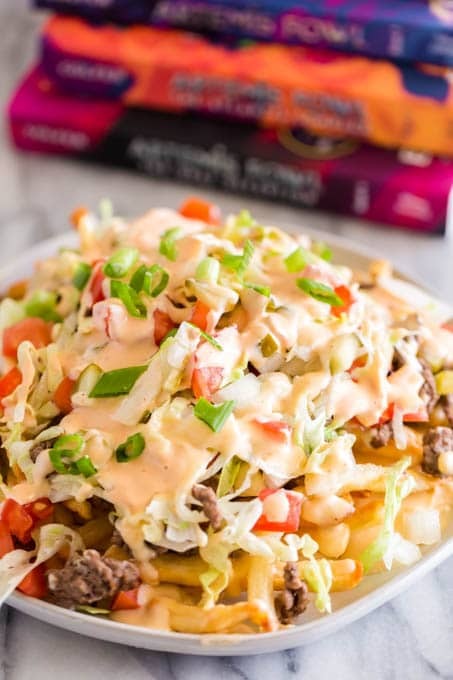 These delicious and easy Loaded Cheeseburger French Fries are a fun food idea inspired by the Artemis Fowl series. Growing up, there was always a lot of reading in our family. Books are a big deal to my people. I credit this to my mama: she spent countless hours reading aloud to me during my childhood. Bedtimes were especially magical. We would curl up with a good book and she would read as I relaxed from the busy day. She always did all the character voices and made the stories come to life as she read. It was amazing and a memory I always cherish. As a result, I have been forever enchanted with a good story. As an adult, reading is still one of my favorite past times. Because it’s such a huge part of my life, it’s something I’ve passed onto my boys as well. I’ve read aloud to them their whole lives — starting while I was pregnant even! Their bedtime routine closely resembles the one I enjoyed as a kiddo. After their teeth are brushed and their jammies are on, we snuggle in for some reading together before lights out. Now that my two youngest are getting older, we’re enjoying reading series together. It’s a fantastic way for us to connect and slow down at the end of our evenings. The boys love hearing the stories and asking questions and I love all the extra snuggles and quiet moments we steal together. 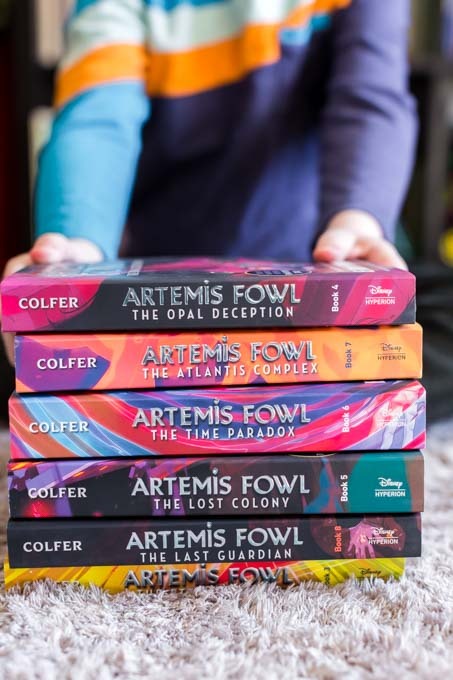 Recently, we’ve been enjoying the Artemis Fowl series. 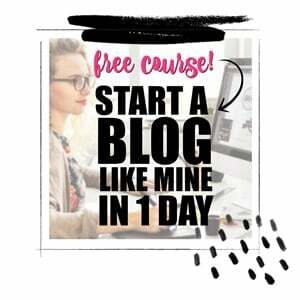 Let me tell you: it’s so much fun to get swept away into another world! 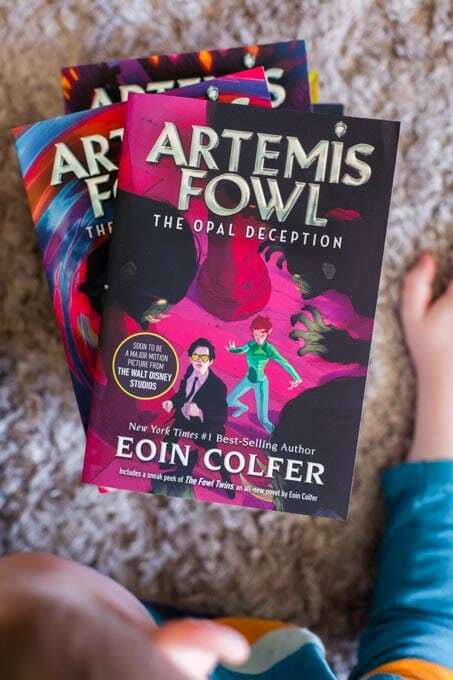 Artemis Fowl is a science fiction fantasy series from the Irish author Eoin Colfer. 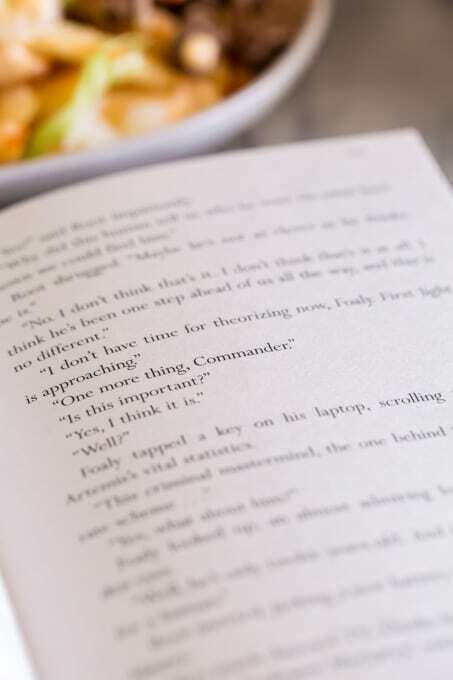 The books follow the twelve-year-old mastermind and genius Artemis Fowl II. Packed with adventure and daring, your whole family will enjoy the series together. 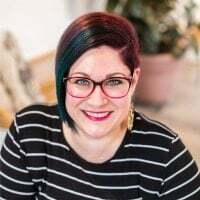 There is a whole cast of incredible characters that you will grow attached to, and a wonderful storyline that you’ll love chatting about long after you’ve finished reading. The books have been recently re-designed with gorgeous new artwork, AND the first book is being made into a movie! While at the theater last week, we caught a peek at the new trailer. The boys instantly started begging to see it. Needless to say, we’re looking forward to the release of the film on August 9th! After enjoying the books so much lately, I was inspired to create a recipe we could snack on while doing some reading together over the weekend. A close second to books in our family is food, and often, the two go hand in hand for us. In the books, Spud’s Spud Emporium is a fast-food restaurant. While somewhat popular, it doesn’t have very good food — the milkshakes are known to be lumpy and the meat is not to be trusted. Burgers and fries are staples at this joint — even though Spud’s version is rubbery and greasy. 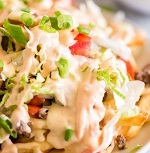 This got me thinking… how about a fun twist on the classic loaded fries? This easy recipe only takes a few minutes to prep and cook — making it great for a fun snack or quick dinner. *I like to cook mine a little longer than the package suggests until they start to brown. My package said to cook for 9-12 minutes at 450*. I ended up cooking them closer to 20 minutes at 450*. In a pan over medium heat, add the ground beef and season with onion powder, salt and pepper. Break the ground beef up and cook until it starts to brown. Add the Worcestershire sauce and cook until the meat is completely done. Pour heavy cream into a microwave safe bowl. Microwave on high for 1 minute. Remove from microwave and add shredded cheese and seasoning. Let sit for 1 minute to let the cheese starts to melt. Gently stir the cheese. Return to the microwave for 30-second intervals, stirring in between until the cheese has completely melted. On a plate, pour about ¼ of the cheese sauce. Then pile on fries, then more cheese. Add half the ground beef, then a little more cheese. Add the shredded lettuce, tomatoes, onions and dill pickle. Drizzle the top with more cheese and Thousand Island dressing. I served this on a 9-inch plate. This recipe will make 2 9-inch plates full. Of course, you could make one large plate or adjust into smaller serving sizes if you wanted to as well. Our family loved eating these fun fries in between reading sessions this weekend. It was the perfect snack for us! The boys immediately picked up on the tie in between our food and the Artemis Fowl books, which I thought was great. 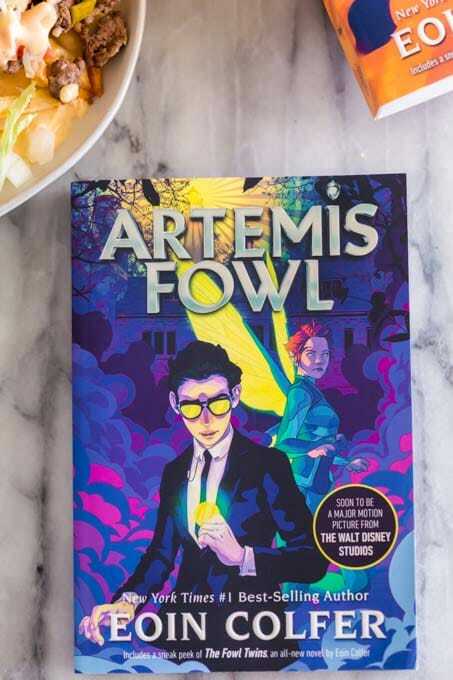 I hope your family will enjoy this delicious idea soon — and check out Artemis Fowl, as well! 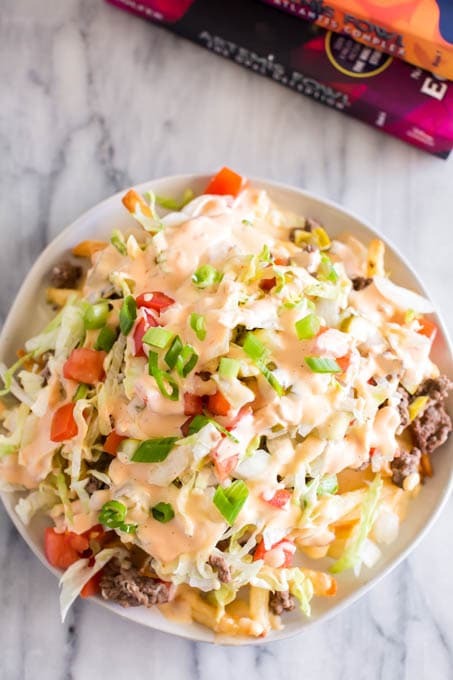 These delicious and easy Loaded Cheeseburger French Fries are a fun food idea you'll love. Pour heavy cream into a microwave safe bowl. Microwave on high for 1 minute. Remove from microwave and add shredded cheese and seasoning. Let sit for 1 minutes to let the cheese starts to melt. Gently stir the cheese. Return to the microwave for 30 second intervals, stirring in between until the cheese has completely melted. *I like to cook mine a little longer than the package suggests until they start to brown. My package said to cook for 9-12 minutes at 450. I ended up cooking them closer to 20 minutes at 450. Great idea to do a book/dinner tie in! My students love thes books also. I do a Book Menu of the month to premier old and new titles in a restaurant type setting. I will have to conisder how to get the actual food! This looks amazing! I will have to try this recipe. My kids would love to read these books. These fries look fantastic! My kids are obsessed with reading and this is the next series I want to introduce them to. Maybe we’ll make the fries when we start the books. Thanks for the idea! WOW! Totally addicted to these!